A friend of mine suggested I try this distro. Now, I often use phrases like 'a friend of mine' or 'a colleague of mine' to create a feeling that I have a rich social life and that people actually care about what I write and such. But I do. I really do. Anyhow, let's try Kali. The real reason for testing this forensics and pentesting distro is my T400 laptop. To this day, there's not a single distro out there that has successfully managed to use its Wireless card without subsequent network crashes. This friend mentioned how Kali comes with a completely reworked network stack, and that it might actually fix the problem. And no, I do not have cliche slogans or catchy titles revolving around the use of the word Kali. Follow me. Kali is a Debian-based distribution, and it continues where BackTrack stopped, another forensic distro that I wrote about in the past, and which became my most plagiarized article evar, with a hundred other sites copypastaing the contents like crazy, back when Google decided its new and would-be improved Panda algorithm is the mad notes. 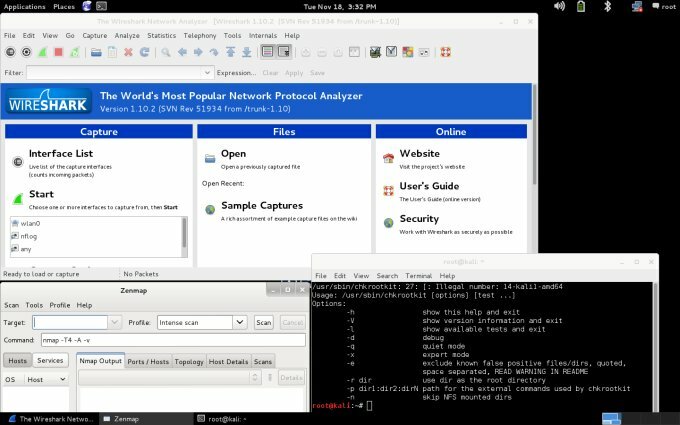 Kali is installable, but the general idea is to use it from the live session, running all sorts of tests and probes and investigations against network targets and offline local storage. It is equipped both with Windows and Linux oriented tools. But all that is secondary. Can it use the T400's Wireless card without oopses, crashes and whatnot? I started testing. The distro boots into a very dark Gnome 3 desktop. The environment is befitting its purpose and mission statement, but the black can get a little oppressive and difficult on the eyes after prolonged use, especially since Gnome 3 does not have a very enviable contrast and DPI. Anyhow, here we are. Apart from the network we mentioned, everything was properly initiated and used. The distro is designed for serious work, but it also comes with normal desktop use components, so you can also enjoy yourself. You get VLC and IceWeasel, plus a handful of other programs that are not strictly related to security testing. Then you get a massive arsenal of tools designed to map, enumerate, stress, and hack networks and systems. In the live session, you're working as root, so do take that into account, including your casual work. Ah, yes, the reason why we gathered in this holy place. Kali connected to both the 2.4GHz and 5GHz networks in my home environment, and things were fine for a brief while. But then, the connection went down, and I was unable to continue using it. Only a full reboot helped, so the situation here was actually a little worse than with most other distros. As you can see above, the screenshots clearly show no network, apart from the hopeful first few moments in the live session. At this point, I decided to be bold and beautiful. I decided to try to update the laptop BIOS. I did this from within the installed Windows 10 tech preview, which resides alongside Windows 7 on the machine's SSD. The flashing completed successfully. However, while the BIOS version reads a different set of number, this did not change the Wireless behavior inside Kali in any way. Which meant there was no reasonable, sane way to fixing this issue. However, the flashing process wasn't without its consequences. For some reason, the Windows 7 activation got invalidated. Something in the BIOS thingie whatnot now probably uses different registers, and these might be clashing with the Windows 7 memory access, and I'm now facing some kind of a weird bug, which means reinstalling everything and hoping for the best. You're reading this article, so let's give you a fair overview of what it can do. 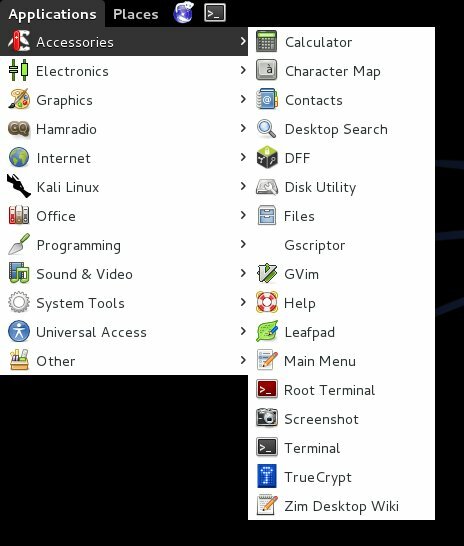 Security wise, Kali is crammed with goodies. But you really must be an expert to use them properly. Moreover, most of the entries are actually shortcuts to the terminal, which launches with the desired application plus the help flag. So you only get a rudimentary list of options and switches, but the rest is entirely up to you. Not for the faint-hearted. Furthermore, some tools throw errors and exceptions, and many others complaining about working as root. Actually, I resumed testing on the T61 machine, where there were no problems with the network connectivity, or anything of that sort. Kali behaved well, within the boundaries of the Gnome 3 framework and its dark theme. All in all, it was an overwhelming experience, with so much security stuff you can spend weeks if not months studying, learning and testing. There are two separate conclusions to this review. No, three. First, do not trust everything your friends say. Second, T400 is still unusable in the Linux world. Three, Kali seems like a very nice security distribution. However, just by using it, you won't become an expert. That's the prerequisite actually. 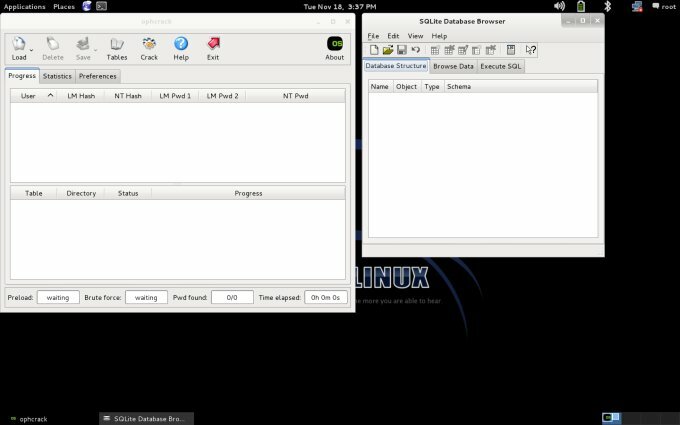 Compared to BackTrack, which it succeeded, Kali feels a little more complete, more robust, even though both distros have the same focus and balance on normal, daily usability and forensics. This is a good thing. Moreover, it offers a wealth of hacking and analysis tools that can not only help you audit and secure your environment, but also learn a whole lot about the network stack and command line usage. A free bonus. If you're a professional or an enthusiast with a interest in the realm of digital security, you might want to give this operating system its due spin, even though it may not magically fix your Wireless. That's a lesson for me. For you, the fun part of exploring, testing and learning. Take care.